Kristina Kallas is the director of Tartu University Narva College. She studied as undergraduate at Tartu University and holds master’s degree from Central European University and PhD from Tartu University in the field of political science. She has worked as a senior policy analyst in the Institute of Baltic Studies in Tartu, focusing on minority issues and the migration and integration policy. She has worked as a consultant for Estonian government in developing national integration strategies since 2007 as well as OSCE project consultant for policy of interethnic relations in the Republic of Kyrgyzstan. In 2014-2015 she worked in several election observation missions in Ukraine. 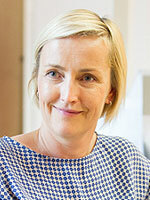 She is also the head of the supervisory council of Estonian Integration Foundation. Her main areas of research are minority rights in nation-building, integration, citizenship and political and ethnic identities. Kristina Kallas, “Claiming the Diaspora: Russia’s Compatriot Policy and its Reception by Estonian-Russian Population,” Journal on Ethnopolitics and Minority Issues in Europe (JEMIE) 15:3 (2016): 1-25. Kristina Kallas, review of “Etnicheskaya politika v stranakh Baltii,” Journal of Baltic Studies 45:4 (2014): 550-552. Kristina Kallas, “Monitoring integration in Estonia,” in Rob Bijl and Arjen Verweij, eds, Measuring and monitoring immigrant integration in Europe (The Netherlands Institute for Social Research 2012).